The Business Budget Planning Tool for Excel provides an effective means to generate a budget for up to five years. Full flexibility allows adding Revenue, Variable Cost and Fixed Cost categories and lines to suit any business. Operation of the Business Budget Planning Tool for Excel is via an easy to use toolbar with function buttons. The budget can be displayed in any frequency combination of month, quarter, or year. Change indicators provide the means to adjust revenue and costs year on year with initial default values applied to minimize input requirements and simplify use. Full 'what if' and sensitivity analysis is available by varying the Change indicators. Budgets can be freely formatted for printing and graphing. 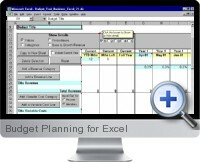 The Business Budget Planning Tool for Excel is suitable for both existing and proposed businesses.